Editor's Note: I include the scan in the hopes that someone might recognize it. The concert was at the Forum (Los Angeles) on June 28, 1981. "I don't understand the world today," Tom Petty sings in a tune from his current LP. His performance Sunday night at the Forum certainly confirmed that. Timing is everything these days in pop music, as Bruce Springsteen proves, and Petty's timing is off, way off. In the nearly two years since his "Damn the Torpedoes" LP elevated him to the rank of top-seller, ths rock scene has undergone some fundamental changes in dynamics which Pertty, locked away in a studio turning out a followup album, appears to have missed. What in 1979 seemed a charming reaffirmation of the American rock tradition, with its bits of Byrds and Dylan and its boyish star, today seems inextricably mired in the past, both musically and theatrically. The onstage presence of Fleetwood Mac's Stevie Nicks, a '70s holdover if there ever was one, to reprise the LP duet, "Insider," only underscores this point. At least part of the problem stems from the new LP, which carbons the style of "Damn the Torpedoes" without advancing it in the slightest. 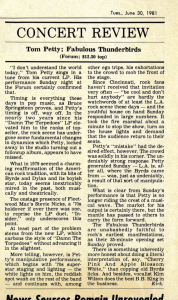 More telling, however, is Petty's manipulative performance, which begins with the '70s superstar staging and lighting -- the white lights on him, the reddish spot wash on the rest of the band -- and continues with, among other ego trips, his exhortations to the crowd to mob the front of the stage. 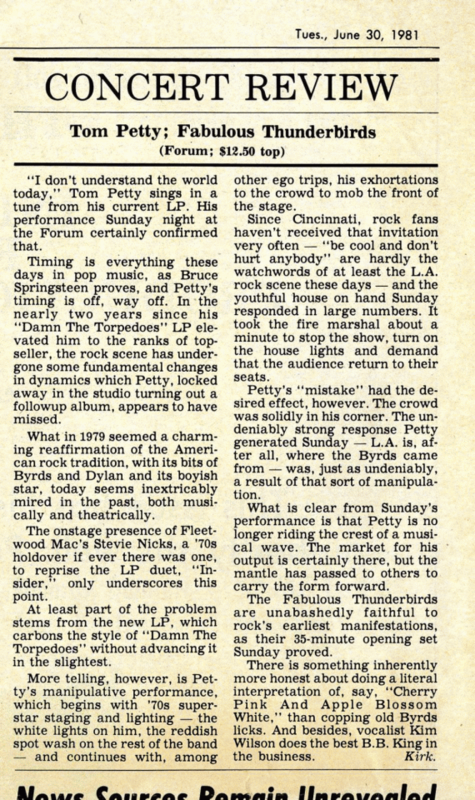 Since Cincinnati, rock fans haven't received that invitation very often -- "be cool and don't hurt anybody" are hardly the watchwords of at least the L.A. rock scene these days -- and the youthful house on hand Sunday responded in large numbers. It took the fire marshal about a minute to stop the show, turn on the house lights and demand that the audience return to their seats. Petty's "mistake" had the desired effect, however. The crowd was solidly in his corner. The undeniably strong response Petty generated Sunday -- L.A. is, after all, where the Byrds came from -- was, just as undeniably, a result of that sort of manipulation. What is clear from Sunday's performance is that Petty is no longer riding the crest of a musical wave. The market for his output is certainly there, but the mantle has passed to others to carry the form forward. The Fabulous Thunderbirds are unabashedly faithful to rock's earliest manifestations, as their 35-minute opening set Sunday proved. There is something inherently more honest about doing a literal interpretion of, say, "Cherry Pink And Apple Blossom White," than copping old Byrds licks. And besides, vocalist Kim Wilson does the best B.B. King in the business.